THE WISE ONE, THE WHALES AND THE DRAGONS. And the warm waters of Bimini, ancient stones of Atlantis and the playful dolphins. Deeper in the South-Pacific islands of Nuie, New Zealand, Australia and to the whales of Rurutu; an Austral island South of Tahiti: http://www.eyewithin.com/p4.html. Then to the mysterious stones and structures of lake Titicaca, and the Andean temples all around Machu-Picchu, Peru. While establishing out sustainable living at home in Kona Hawaii... Jean-Luc joined his mystical adventurer friend Alexia in early 2009 to follow the sinuous serpentine tropical rivers, and to continue to explore and understand the mysterious Wizard of Kauai. The journey went on into deep valleys with their remaining stones from the ancient mystical schools of Molokai and led us to enter the natural dwelling of the Mo'o, the pools and caves of the water Dragon, and the misty winds that rise up from the high water falls. We started at the Iao valley on Maui (right). 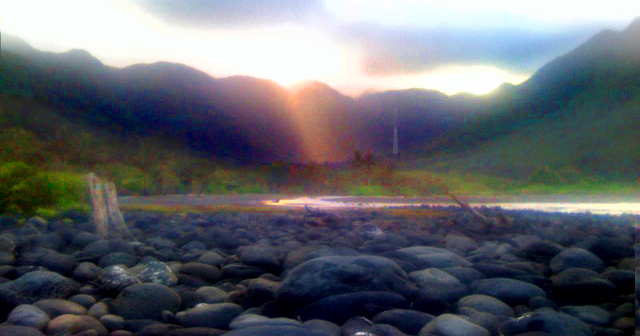 Iao was a power spot but many died to conquer it. That night I had a dream that I was on the Machu-Picchu train; I wanted to repair a broken wagon, stones were falling from roof holes but ghosts were interfering. I Felt the ghosts were from Iao old Hawaiian battles and the Machu train was the symbol of the means to transit from the empirical world to the mystical underworld. My dream prompted me to think that before we connect with "Dragon Spirit" we need to clear up the dark veil of the collective fear regarding medieval darkness --- where dragons hid beyond the somber cloud of lost souls trapped in the abysses of these dark times... as well as the historical misuses of gloomy power in our western cover up. Purification, transmutation and Alchemic efforts are needed to clean up the spirit field between humanity's 3D heavy limited thoughts and the lightness of beings in higher consciousness . In an effort to Balance Male sites and Female sites we paid homage to Kukuipika heiau, a healing refuge, and the heaiu of Pihana where we felt heavy sadness from the spirits of Hawaiian women not able to be heard by their male warriors. Or was it mostly a collective projection much more obvious in such a powerful natural point??? Remember! Shamans of all races have a natural gift to find Nature's power spots... it is in our cells as we are one with Nature. Next we journeyed to North Maui facing Molokai where there is a rocky point called the Dragon's Teeth. Hard to believe but the rocks there look like petrified teeth, scales, claws and dragon's heads. Very stimulating to walk between such real rock shapes of our unreal dreams! Then we flew off to Molokai to learn that the Mo'o or Dragon is the Keeper of timeless knowledge. We went down the sheer cliffs of Kalaupapa's mule trail to the notorious spot where those with Hansen's disease (leprosy) were isolated, but behind the sad history of this place is a deep crater lake where the very murky water becomes clear and warm 20 feet under the surface... another hidden clue to... clarity behind the veil of fear. Of course our inner intentions led us by chance to meet an Hawaiian teacher when we needed some directions. By chance or what, we met three generations of Kumu (teacher) during these few days. How far can we go? this depends on the spirit behind our intentions, that is guiding us... that is the tail of the dragon, the most powerful body part of the Mo'o, one of the Kumu's reminded us. Another day we hiked Molokai's Forest Reserve high ranges, a long walk along tall trees to suddenly falling into a short nap on dry needle pine ground ( sometime dream state is the only mean to receive certain info. ), Then we carried on on a narrow board path across mossy, swampy bog land until the path ended at the next clouded valley. Thought we were looping around back to the first look -out but our path got us lost so we return...all the way back to find our car battery dead. Luckily, the only truck we saw all day jump started our car and very relieved we could return home to shower off the mud and appreciate a a warm dinner. Note: we could not first rent a car but got a private local car from a guy with a dragon on his tee-shirt, then we could not start the car to leave the very isolated rain forest and the guy who jump-started our car had a dragon on his tee-shirt. Seems the dragon is opening the way for us! The MO'O is the Dragon who brings the wisdom beyond duality, and embraces the Darkness as well as the Light. The myths and fables of the dragon still carry the energy of the removal of innocence and illusion. To conquer our own fears is to acknowledge them and to embrace them.,,,, more about courage than fearlessness. I am grateful to my dear friend for her very open mind, and so explore the journey deeper here with Alexia's navigation skills in reading the unseen Stargrid maps. Life is about asking questions, not about knowing answers... Life is an Infinite Mystery and as long as we go through the walls of our fears, we then experience and enjoy this life with the fun spirit of discovery, the sweet compassion for others, and the original Passion for Creation that merges with the glory of the Universe. Dragons are beyond the cartoon figures of legends... Dragon is an energy holding a wisdom and a love beyond our world of bad and good. Humanity's attachments to old beliefs are the challenges to face this abundant powerful matrix form. We may need to slightly alter our brain waves ( or open our heart ) to perceive their patterns and interact with such beings. these are patterns of our energy field that architects innovations for our next paradigm.